Salaries in the Occupational Health and Safety field are in the upper-mid range for professional individuals, with managerial positions being at the top. 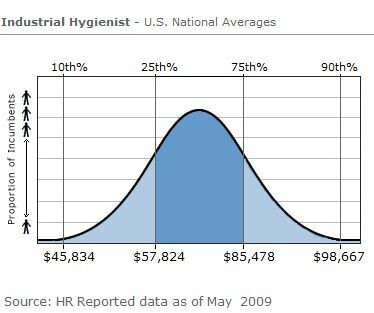 The average Industrial Hygienist salary is approximately $71,650.00. A quick search of open Industrial Hygiene positions reveals 1300 jobs related to IH with a salary greater than $40,000.00. Much like the rest of the economy, salary trends for Certified Industrial Hygienists have seen a sharp drop in 2009, however, there has been an increase since April 2007. The average Health and Safety Manager (i.e. Safety Professional Manager) salary is approximately $114,490.00. 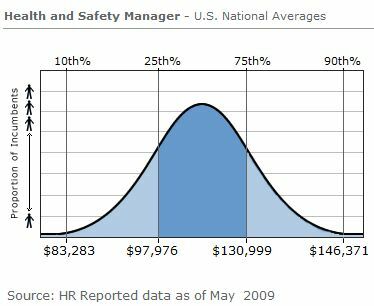 A quick search of open Safety Professional positions reveals 400+ jobs for safety professionals with a salary greater than $40,000.00. 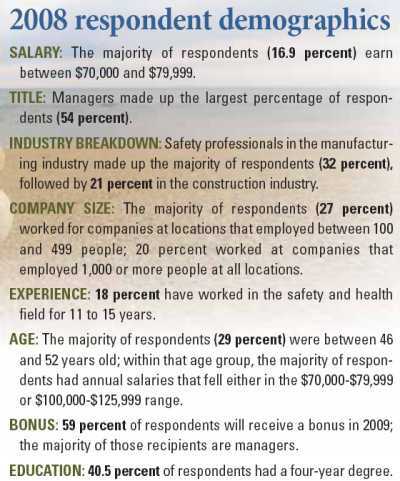 Much like the rest of the economy, salary trends for Certified Safety Professionals have seen a sharp drop in 2009. The average Environmental, Health and Safety Manager salar is approximately $125,800.00. A quick search of open Environmental, Health and Safety positions reveals 600+ jobs for safety professionals with a salary greater than $30,000.00. Much like the rest of the economy, salary trends for Environmental, Health & Safety Managers have seen a sharp drop in 2009.